Products for sale on Amazon with videos have had an advantage over other products for many years. Now that Amazon is opening up video for 3rd party sellers, it is important to know a few things before you start creating video. A product video on Amazon is not taking your photos and making a photo slideshow. That doesn’t provide any value for the viewer. Yes, photos are important. We love product photos. We even offer product photography services. While they are the first thing people see in your Amazon listing, they are not a video. Video allows people to see how your product looks as light moves across it and as people interact with it. Video helps the viewer understand the size of your product in relation to the items around it. Done properly, it also helps people see themselves using your product. We have helped a lot of brands, both big and small, create product videos for use on Amazon and other online retailers. The following are some of the things we have learned. Having the product in an environment where the product would actually be used is important. However, if you don’t have the budget for a real environment, also called lifestyle video, having people in your video interacting with your product is the next best thing. Having your product alone on a white background doesn’t help the viewer as much as seeing it in the real world does. When done right, video creates an emotional response in the viewer. People make buying decisions emotionally, not rationally. This goes for everything we purchase at home or work. A study by the company Internet Retailer found that video increases the likelihood that people will purchase your product by 85%. Choose the best-looking version of your product. Make sure your product doesn’t have scratches or defects in the materials. Scratches and defects will show up on camera and make your product look bad. It is hard to remove defects in video footage and even though it is possible, the cost is not worth what could be done with some proper planning. It can cost tens of thousands of dollars to remove a scratch from a product video, so I don’t even consider it an option, unless you are selling something like a car. If your product is reflective, make sure there is a plan for how you will deal with that. Always have more than one product on hand during a shoot. We did a big 5-day shoot for a coffee maker and, on the morning of day two, the machine quit working. Fortunately, we had multiple machines and were able to pull another one out of the box. Stuff happens. It can save you a lot of money by having two or more of everything just in case something goes wrong. How long should your product video be? The length of your video depends on what type of video you are going to create. When I spoke with Amazon a few years ago, they were really pushing for videos to be about 30 seconds long. That being said, some of the styles of video we are going to look at in this article can’t be fully implemented in 30 seconds. That is OK because if they are done properly, the viewer will stick with them because the content is valuable. However, your video should only be as long as they need to be, no longer. As far as I know, Amazon doesn’t allow you to test your video or give you any metrics as to how well your video is being received. I think this is one of the biggest problems with Amazon video and this is why you need to test and tune your videos using other sites such as Facebook and YouTube. What does a product video cost? There is no easy answer to this question what does a product video cost. The more videos you create at one time, the less each video will cost. For this to work, you need to create a template that can be used for each video. While this will make each of the videos similar, it is a good trade off, if budget is a concern. If you need a specific location or actors on screen, this all causes the price to go up a lot. The more detail in your video, the more it will cost. The internet has grown up and bad looking video is no longer acceptable, so make sure you invest in video that has proper lighting and sound. There are many different styles of videos that you can create for your product. You can include actors or locations to help tell your product story. It can be done with a model or spokesperson or you can use a professional voice over artist. You can use a ‘how to’ video; which does a good job of showing the product and explaining what the viewer is going to need to do when he or she purchases your product. The video might look more like a TV commercial or it can combine studio footage and stock footage. The possibilities are endless. If you have a physical product, I would recommend steering away from animation. People want to see your real product. However, it is not uncommon to see a life like 3d rendering used in product videos. Car companies do this all the time in their TV commercials. Just know that 3D imagery done right is expensive. The most effective type of product video is what we call ‘hybrid product videos’. They are also the most expensive. They combine the best part of traditional branding and the infomercial. So, what does that look like? With traditional branding, think Super Bowl commercials, strong brand identity, emotionally driven without an in-your-face sell. (Note: These videos also don’t include the million-dollar price tag that Super Bowl commercials have.) Now combine this with the best part of traditional infomercial: problem/solution. This type of video works best for risk takers because the return is huge but the investment, while less than traditional media, still costs money. Keep in mind that Amazon is the largest product search engine. This means that when people are looking for a product, they go to Amazon. The better your product ranks on Amazon, the more you sell and the higher you will rank. The higher you rank, the more you will sell. Video can help with that. Amazon has also started offering video ads to people on their site, with ads that are 15 seconds or less being the most effective. You may then want to create a longer version of the video for your product page. Send us your products and we will create awesome videos. 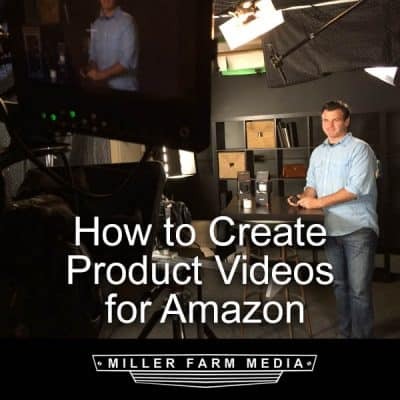 We have a system for effective product videos for Amazon, no matter where you are in the world. If you have a product, we should talk.